Plot: At the top of the Empire State Building, Poseidon (Kevin McKidd) meets with Zeus (Sean Bean), who comments that the storm clouds have no lightning and that his master bolt has been stolen. He blames Poseidon's son for the theft. Despite Poseidon's claims of his son's innocence, Zeus gives Poseidon 14 days to return it, lest war break out. 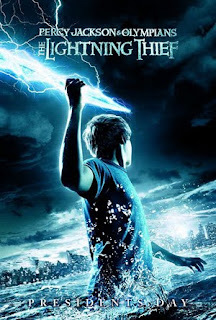 During a field trip to an exhibition of Greek and Roman art, teenager Percy Jackson (Logan Lerman), is lured away from the crowd by a Fury, Mrs. Dodds, disguised as his substitute English teacher, who then attacks him, questioning him about the lightning bolt. The incredulous Percy, who has no knowledge of this, is rescued by his Latin teacher, Mr. Brunner (Pierce Brosnan). After dispatching the Fury, Brunner gives Percy a sword disguised as a pen. On Brunner's instruction, Percy's best friend, Grover (Brandon T. Jackson), takes Percy to a training camp for demigods, Camp Half-Blood, along with Percy's mother, Sally Jackson (Catherine Keener). During their trip to the camp, Percy attempts to learn about his biological father from Sally, but they are attacked by a Minotaur. Although Percy and Grover, who is revealed to be a satyr, make it to the camp, its defenses prohibit entrance to Sally, who is captured by the Minotaur, and disappears before Percy. Percy engages the Minotaur with the pen, which turns into a sword named Riptide, eventually killing the creature with one of its horns. In touring Camp Half-Blood, Percy learns that Brunner is the mythological centaur Chiron, and the camp's trainer, and that his (Percy's) father is the god Poseidon. He also meets Luke Castellan (Jake Abel), a son of Hermes, and Annabeth Chase (Alexandra Daddario), a daughter of Athena. While at the camp, Percy learns that water has the power to heal his injuries, and allows him to manifest his magical abilities. Starring: Logan Lerman | Brandon T. Jackson | Alexandra Daddario | Jake Abel | Sean Bean | Pierce | Brosnan | Steve Coogan | Rosario Dawson | Catherine Keener | Kevin McKidd.